On Sunday mornings, I watch Face the Nation. 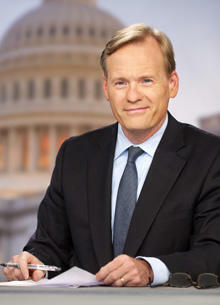 I’m a fan of John Dickerson who combines high intellect and deep journalistic roots with a personality best described as Boyish Dweeb. Unlike his Sunday morning competitors on Meet the Press and whatever ABC calls their Sunday morning show these days, Big John eschews style and flash for insightful interviews that are fair, pointed and effective. It got me wondering, in 2017, how do we actually define the term “Presidential?” What exactly do we Americans want out of our president? For me, I would define the term as acting with honesty, grace, subtlety, strength, wisdom, integrity, decisiveness and courage. The president should be bold and compassionate. The President of the United States should always act in the best interests of our country, while remembering that it is in our best interest to be a citizen of the world. The president should use personal experience to represent all communities and assemble the finest, smartest, most diverse group of people he can for advice and to act as Presidential agents. There also should never be any question about who is in charge of the Executive Branch of government. All the presidents in my lifetime have had most of these traits. I don’t think a single one of them hit every mark, but with the possible exception of Richard Nixon, they all had a lion’s share of what we want. Unless you want to throw the fictional Jed Bartlet into the mix, none of our presidents have been perfect from Washington on up. By and large, however, since the days of FDR, America’s been on a decent run. President Trump is bold and decisive. But the other characteristics – honesty, subtlety, wisdom, integrity, courage, compassion, and grace – are lacking in his character, if they’re present at all. Our president is a common bully. He’s that guy at a barbecue who drinks way too much and talks way too loud. He’s the guy who likes to insult people in front of their kids. He’s the guy who thinks he’s charming and loved but never takes the time to notice that nobody really invites him to things. He shoves people out of the way because he thinks he’s more important than they are. He’s an intellectual klutz. He’s not well spoken. He’s not particularly bright. He’s a caricature of himself: the guy who sits at home at night watching FOX News and tweeting about everything that pisses him off. This is redefining what it means to be presidential? No. This is redefining what it means to be an American. As a nation our position in the world stems from the fact that we are among the wealthiest, the strongest, and the most compassionate countries, and we hold ourselves to the highest possible standards. We created a mighty middle class that fostered the American Dream. Our free economy and liberal immigration laws made us the land of opportunity. An American citizen has the right to conduct him or herself however they may choose, providing they submit to the basic rule of law. While that has left us open to criticism and attack from other nations, by the end of the 20th Century, America had proven that a free society was not just something to aspire to, it was something to be embraced and emulated. The president should reflect those values and accomplishments. We should see them in a president’s personality, in the things a president says and in the way the president carries him or herself. But we didn’t go looking for that in the last election. Our country is more polarized and less united than it has been in fifty years, if not longer. The main reason for that is leadership; in the executive branch, in Congress, in local and municipal government and in the media. It was happening long before President Trump took office, but this president isn’t even trying to bring us together. He is using the split between Americans to his full advantage by playing on our fears, lashing out at his critics, and stocking his cabinet and the crowds at his events with sycophants. Every photo op and every public address is greeted with cheers and exuberance so wholly expected now, they may as well be canned, because he wants us to think that everyone agrees with him. If we disagree with him, we’re just a bunch of losers. The President of the United States is a strong man who believes he can get his way – and govern – not by being the smartest guy in the room, but the loudest and the most intimidating. That may not meet the classic definition of “Presidential,” but it surely does equate to the new, implied definition. Today we don’t have a President so much as we have a Don (please pardon the pun). He’s the guy in charge, without question. He wants to rule with an iron fist. He doesn’t have time to put things through Congress, because he has no patience for committees, so he makes Executive Orders. I also get the feeling he’d like to have a few guys wacked. This is nothing new for a president, until you consider that the former head of the FBI is probably on that list. We brought this on ourselves, America. After eight years of slow paced growth and thoughtful, understated leadership, the country was primed for some bombast. We looked for change by demanding a candidate who called things as they saw them. We wanted the populist/socialist who was going to make the 1% pay their fair share. We wanted the populist/capitalist who was going to give us more “wins” than ever before. We were slow and steady for eight years, and we got bored. We were paying far more attention to our divisions than the things that once made us strong as a country. We elected the loudest candidate, because we thought he would bring us to new and greater prosperity. While he didn’t win the popular vote, he campaigned so hard on his “Make America Great Again” platform, that he could rightfully claim a mandate: America First. We handed this to him. We knew who Donald Trump was. Say what you will about the man, but he is not disingenuous. He is acting exactly the way he told us he would. And by giving him this job, we, the American People, have redefined what it means to be Presidential.